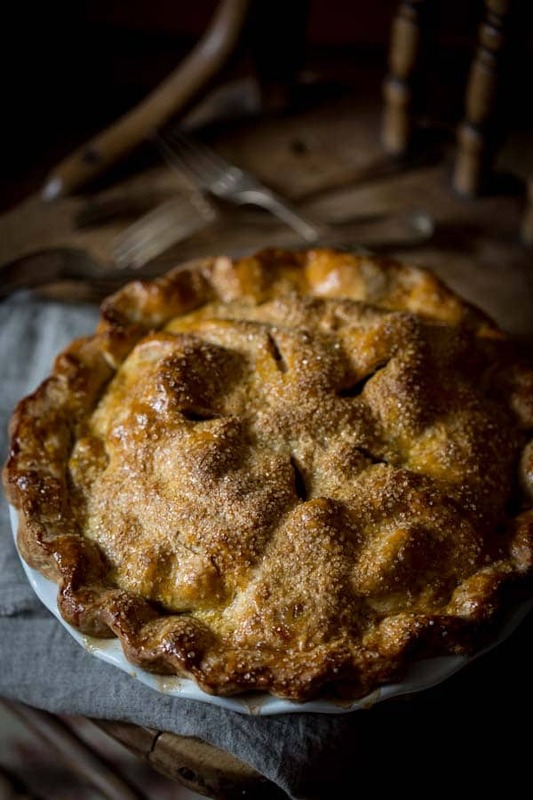 This double crust deep dish maple apple pie is a classic fall dessert that is hard to beat. If you love homemade apple pie and you plan to make one for Thanksgiving, then you’ll want to try this one. In this recipe, I have included a step-by-step explanation of how to get great results (even for pie beginners). 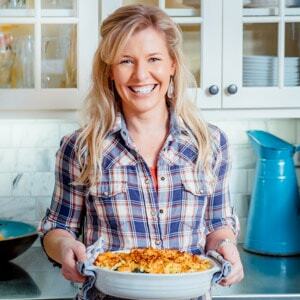 Plus I am going to tell you my number one top tip to make blue ribbon apple pie. 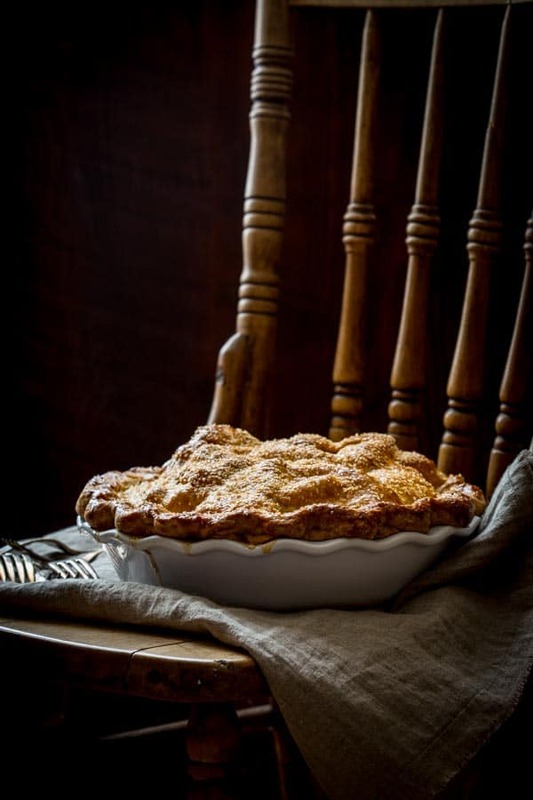 It’s hard to believe that I have been blogging here since October of 2009, and this is the first time I have shared a double crust pie recipe with you. I am not sure why I tend to go for crumb top pies, single crust pies and tarts. But that needs to change! Today is the day. This whole wheat pie crust is a variation of my easy peasy food processor pie dough. There are a few things to keep in mind with the crust. When you measure the flour, stir the flour in the canister or bag first, then scoop it into your dry measuring cup. Then level it off with a knife. Otherwise if you scoop down into the bag with your measuring cup you’ll compact the flour and end up with too much flour in the recipe. That opens up a can of worms for what is to follow. Next, cut in the butter first with the food processor. If you don’t have a food processor or you want to do this by hand, use a pastry blender, two knives, or quickly work it in by hand. Then add in the oil. I use some butter and some oil. A little bit country, a little bit rock and roll. One problem with the oil is that it browns more than the butter, so don’t try subbing all oil in. The crust will be too dark and crisp that way and not flaky. Next, finish with ice water, checking for the correct texture as you go. If you add too much water, the dough will become sticky and tough (from too much gluten development). Not enough and it will be really hard to work with and crumble apart. The humidity outside, the brand of whole wheat flour, and the amount that you cut in your butter will affect how much water you’ll need. Form the dough into two discs, wrap it, and refrigerate it. Food Nerd Alert: Butter, when cold, is a solid emulsion of liquid and fat. The liquid (or milk solids) is held in suspension with the butter fat. 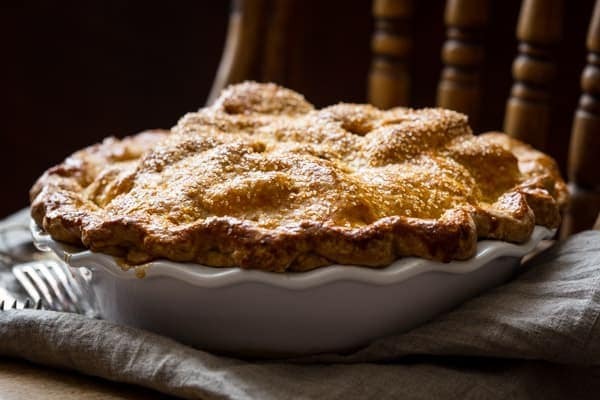 It is important to keep the butter cold throughout the process of making pie crust so that the milk solids do not activate the gluten in the flour. 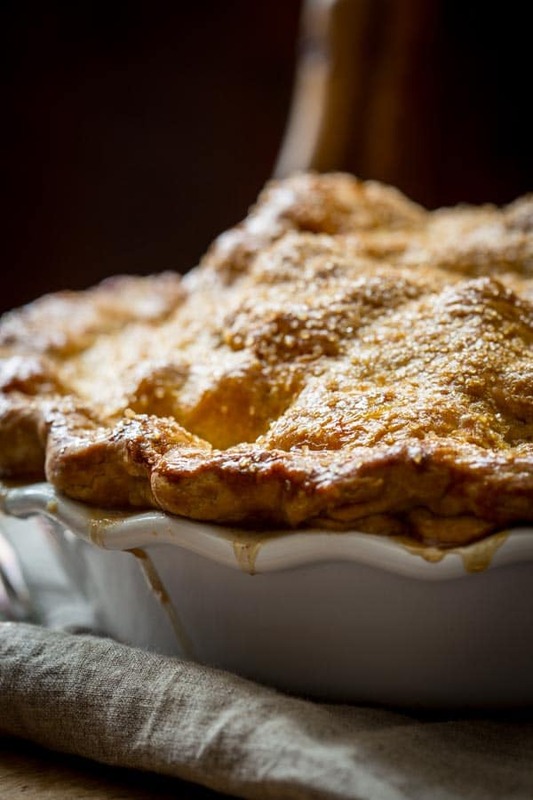 Also if the butter gets too warm, before the pie goes into the oven, the crust may slump or collapse in the oven before the structure of the crust has a chance to set up. Refrigetrating the crust is important because it allows the gluten to relax so the crust will be easier to roll out. It is also important because it firms the butter back up so that it will not melt into the flour, activating the gluten and therefore making it tough, or cause it to melt and slump in the oven before the crust walls set up. The takeaway: keep your butter and water cold! To form the pie crust, roll out one of the circles, and place it into the deep dish pie plate. Gently press the corners down into the dish without stretching the dough. Add the filling (more on that below.) Roll out the second crust, lay it on top. Roll the top crust underneath the edges of the bottom crust and then crimp it. I added in lemon juice for a smidge of tart acidity. And I use two thickeners, flour and cornstarch to get the perfect level of juicy appley goodness. I made this deep dish pie with a full teaspoon of cinnamon and a touch of nutmeg, and I have to say that the spice does cover up the maple flavor quite a bit. If you want the maple to come through more, use just a half teaspoon of cinnamon. Now for my blue ribbon tip! 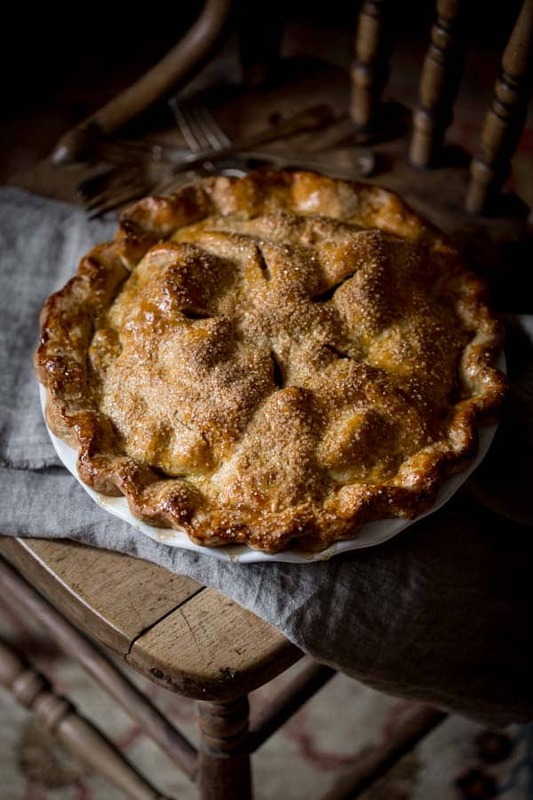 The key to the best maple apple pie is blending varieties of apples. I use half Macintosh apples and half firm sweet apples. The Macintosh break down and become juicy. They have fantastic flavor, but really have no structure once cooked. Then I use half firm apples such as Honey Crisp, Ginger Gold, Cortland, or Mutsu if you can find them. 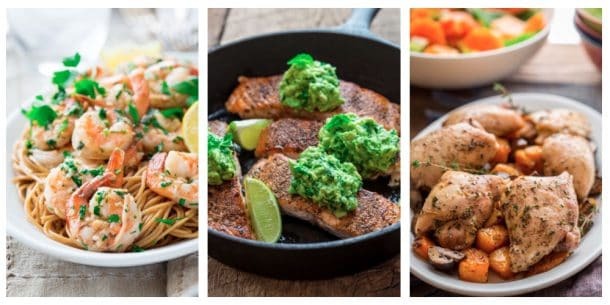 The best bet is to use some of each to get the most complex flavor. These firmer apples hold their shape, which makes it yummier, and keeps the filling from turning to mush. After the pie is built, brush an egg yolk over the crust with a pastry brush, and then sprinkle on some coarse turbinado sugar for crunch and sparkle. You can skip this step, but I highly recommend it. It makes the crust brown beautifully and I love the look and texture of the sugar. Don’t forget the steam vents! Oh, and you’ll need to bake this pie on a baking sheet. It is crazy juicy! 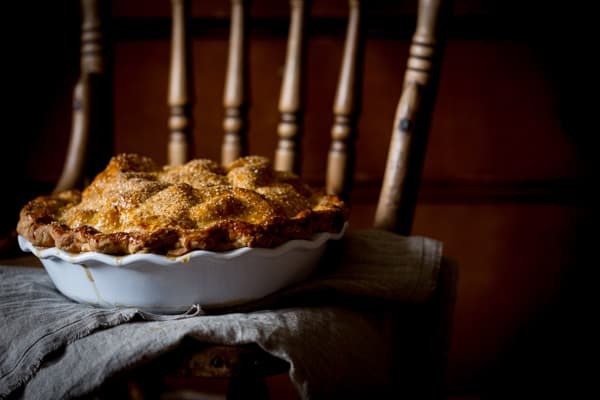 Deep dish double crust maple apple pie, a fool-proof recipe for Thanksgiving dessert. Blue ribbon pie making instructions for beginners and a healthy crust! Make crust: Pulse whole-wheat pastry flour, all-purpose flour, maple sugar and salt in food processor. Add butter, and process until the butter is cut in and the mixture resembles coarse meal. Open lid, drizzle on oil and pulse to combine. Open lid and drizzle on ½ cup ice water. Process until the mixture just comes together. If the mixture seems dry or does not come together as a ball, try squeezing a handful of the crumbs together. If it still won’t come together, add up to ¼ cup more ice water. Divide dough in half and form into two disks, wrap in plastic and refrigerate until firm and chilled, at least 1 hour. Arrange oven rack in the center of the oven. Preheat oven to 350ºF. Line a baking sheet with foil or parchment. Make Filling: Toss Macintosh apples, firm apples, maple syrup, lemon juice, all-purpose flour, cornstarch, cinnamon, nutmeg and salt in a large bowl. Lightly dust work surface with flour. Roll one dough disk out to a circle, about 14-inches across. Transfer to a 9-inch deep dish pie plate. Press dough gently into corners of the pie plate. Add apple filling to the pie shell, arranging so they are as compact as possible. Roll the second dough disk out to a circle, about 12 inches across. Lay over the apple filling. Roll edges under, and crimp edges to make fluted edge. Brush egg yolk over the crust. Sprinkle with turbinado. Cut five 1-inch long steam vents in the top of the pie. Place pie on the prepared baking sheet. Bake pie until the crust is golden brown and the filling is bubbling out the vents a bit, 60 to 80 minutes. Let cool on a wire rack until room temperature before cutting. 4 firm apples, such as Honey Crisp, Mutsu or Ginger Gold. About 1.75 pounds each. The macs will break down and become very juicy the firm apples will hold their shape and give great texture. i love the addition of maple to this pie! Its gorgeous! Thank you so much Dixya. I appreciate it so much. Simply stunning! 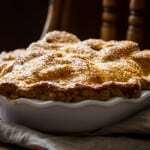 I don’t even like apple pie, but the photos make me want to try! I have always been too nervous to make a pie crust from scratch, but your step by step tutorial makes me feel like even I could do it. I love the tip about the filling too! Did I know that about you? I love it. I am so into that stuff, so I am sure we would have so much fun nerding out together about it! Ha ha! Okay, next time I see you, we have to plan out time to talk food science. It makes me so happy to do so. Thank you Nicole. I love your photographs so that is such a nice compliment. Hope you have a great holiday as well. You’d never guess this was a healthier pie! I love the addition of maple syrup—genius! Gorgeous photos! This pie definitely would take the blue ribbon at any pie contest!